Some of the best cooking advice that we’ve gotten this summer comes from the following suggestion: Don’t cook. This may seem like an odd recommendation on a cooking blog, but bear with us. The advice comes from Belmont Butchery. Since we talked about them on Thursday, we might as well keep heaping the praise on our favorite shop in Richmond. Anyway- when it gets hot and the days are long, standing behind a hot stove may not be your idea of fun. But, of course, you still have to eat. So! 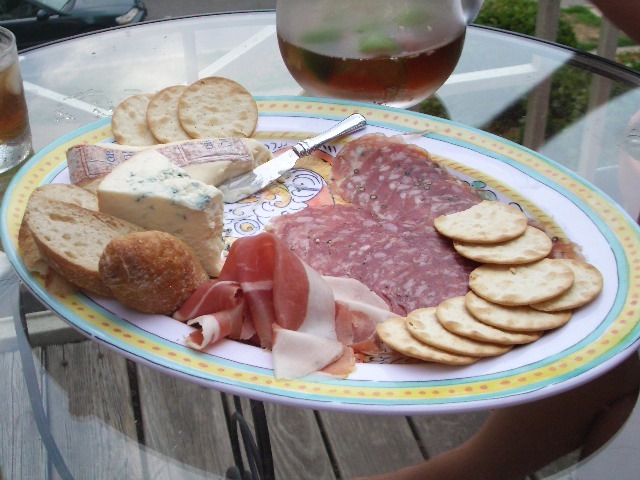 Assemble a charcuterie plate for dinner and have a nice, relaxed, no-cook dinner out on your patio. We combined two great cheeses (an italian soft cheese and a blue cheese from Virginia), 2 kinds of salami, beautiful slices of prosciutto, water crackers, and crusty baguettes for our charcuterie plate. The plate was actually created by our good friends, Perry and Dan. (We have to give credit where credit is due.) The four of us enjoyed the meal with a big pitcher of dark and stormys and watched the world go by from our little perch on the patio. Isn’t summer great? Hi Mike- We spoiled ourselves and got this prosciutto from the butcher. Not frugal, but an incredible difference in quality from anything I’ve had before. Thanks for your suggestion on Costco- we usually go to Trader Joe’s for our frugal prosciutto, but it’s good to know that there are other options! I love this, so simple and elegant. Where do you get the proscuitto? I did a recent post about how reasonably priced this is at Costco. Thanks so much for the charcuterie dinner idea. Working all day – and coming up with something special for our 38 anniversary – you hit the mark. It was perfect – and so romantic with candles and a great bottle of wine. Going to Richmond today (8/20) and going to see your folks this weekend AND sing at your Dad’s church on Sunday. Love you website – thanks so much. Loved the charcuterie pic. We had something similar last night– no cooking as well–a little shrimp w/ cocktail sauce, homemade pimento cheese, a bagette with cucumber and maguaritas; it reminded us of the two of you! We also loved the lobsta entry and thought the picture was fabulous. Don’t you so wish we had some RIGHT NOW?! It was soooo goood . . .